Sterling silver is 92.5% silver and is sometimes referred to as "pure silver". The remaining 7.5% is usually copper but can be other metal and is used to give this precious metal strength and durability. Silver which is 99.9% silver is too soft to be practical for most day to day uses. Sterling silver is bright but can be treated with different finishes. Brushing and etching will give a duller textured surface whilst oxidised silver has a dark gunmetal appearance. Sterling silver can be rhodium plated which slows the tarnishing process. Rhodium plating dulls the colour of sterling silver giving it a shiny, grey appearance. Beware of nickel content as many people have an allergic reaction to it. 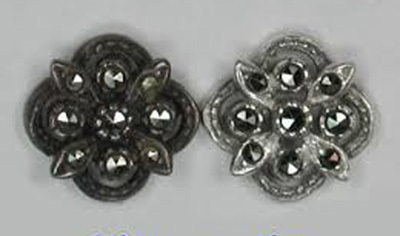 Choose nickel-free rhodium plating. Sterling silver contains 7.5% copper alloy and it is this element of the precious metal that reacts with the air and causes tarnishing. All sterling silver will tarnish over time and oxidisation (moisture from the air or skin acids reacting with the copper) will casue the silver to go black. Some people have particularly acidic skin oils and this can accelerate the tarnishing process sometimes to the extent that they cannot wear sterling silver. Rhodium plated sterling silver will help to prevent and slow the tarnishing process. With care and regular cleaning sterling silver can be restored to its "good as new" sparkling condition. Keep silver jewellery out of the air and light when stored to prevent tarnishing. A protective jewellery pouch, a lined box or just wrapping in acid free tissue or soft cloth are all suitable but best of all are air-tight sealed plastic bags. Each piece of jewellery should be stored in a separate compartment to prevent scratching as a result of pieces knocking together. Gem-set jewellery will undoubtedly contain gemstones which are harder than silver and will therefore scratch the surface of the silver if allowed to jangle together. This holds true for gold as well. Treat your jewellery with loving care and respect and it will stay young looking. Washing Up, Spring Cleaning or DIY? Remove your jewellery when carrying out cleaning or other chores. Cleaning fluids can dammage both the metal and the gemstones. A mis-hit with the hammer could end a beautiful relationship with not just your engagement ring. Remember to put your jewellery on after applying make-up and the hairspray and avoid contact with fragrances. Remove all jewellery before entering a chlorinated pool. If you're contemplating a sauna, remove all jewellery as it will burn you when it heats up. Many gemstones are damaged by prolonged exposure to heat. Most of us come off the beach on the first day with the 3 s's all achieved - rings caked in sand, sea-salt and suntan lotion. Remove your jewellery before a day on the beach. Remember also that sand will scratch the surface of precious metals, particularly silver which is relatively soft. Tour de France, Running the Marathon or Sport in General? Perspiration can be terminally damaging to sterling silver. Some people have acidic perspiration which can blacken sterling silver beyond restoration so remove it before training. Sweat will not enhance your jewellery and no-one will be looking at it anyway. Natural body oils, soap and regular daily dust can build up on your jewellery. A mild soap in water is usually enough to clean it. If gem-set, use a soft toothbrush to gently clean the surfaces of the gemstones. Remember the backs! Gently pat the jewellery dry. Do not use tissue or anything other than a jewellery cleaning cloth to polish your jewellery as unseen tiny hard fibres on other cleaning cloths will scratch the surface. If more serious cleaning is required, then use a good jeweller's rouge or jewellery cleaning dip. We recommend Silvo for heavily tarnished silver. However, if your silver is gem-set see the notes below for each gemstone to be sure of what is safe to use. Some cleaners which are ideal for sterling silver may be too harsh for the set gemstone. Ultrasonic cleaners are not recommended for anything other than plain silver jewellery. They can dammage pearls and gem-set jewellery. If cleaning ruthenium plated sterling silver jewellery, reduce the time the jewellery is in the ultrasonic cleaner and dry immediately it comes out. First of all, a note about the hardness and therefore relative durability of gemstones. To measure hardness, the jewelry industry uses the Mohs scale. This gem-trade standard, conceived by Friedrich Mohs in 1812, measures the ability of a gem or mineral to resist abrasion damage. Diamond at 10 is the hardest whereas talc at 1 is the softest. Popular gemstones like amethyst and citrine register 7 whereas rubies and sapphires register 9. Most substances your jewellery is likely to come into contact with will be around 7 on Mohs scale so any gemstone with a hardness higher than 7 is unlikely to scratch. Precious metals (silver, gold and platinum) are quite low on the Mohs scale - less than 4.5 - and will scratch. How Do I Clean Semi-Precious Gemstones? Turquoise is chalky in texture and is to be treated as fragile. Always store carefully in a separate compartment to avoid scratching and chipping. It will scratch easily and chip if subjected to rough treatment. It does not like to be immersed in water and does not respond well to chemical contact. Either can cause it to change colour - usually turning more green. To clean, use a damp cloth to wipe the surface. Take a look at our collection of turquoise jewellery. Lapis lazuli is a soft stone and like turquoise will chip easily. Always store carefully in a separate compartment. To clean, use a damp cloth to wipe the surface. Do not immerse in water as this can remove the protective coating. Avoid contact with all chemicals. See our lapis lazuli jewellery. Coral is a soft organic gemstone and porous. Always store carefully in a separate compartment as it will easily scratch or chip. Avoid large variations in temperature and prolonged exposure to sunlight. Pearls are less durable than most gems. They are sensitive to acids, dryness, and humidity. Avoid contact with any chemicals such as hairspray and perfume and wipe them clean with a soft cloth after wearing as natural body oils can discolour them. Store them carefully, preferably in a pearl necklace box, a chamois bag or in tissue. Don't throw them in a box with other jewellery as harder gemstones will scratch a pearl's surface. Cultured pearls can be washed carefully in mild soapy water. Do not dry in heat. Wipe dry with a soft cloth. If worn often, restring every 2 years. Store larimar carefully, preferably in a separate jewellery compartment, a chamois bag or in tissue. Avoid contact with any chemicals such as hairspray and perfume and wipe clean with a soft cloth after wearing as natural body oils can dull the surface. Avoid prolonged exposure to bright sunshine as this may cause colour fading. Clean in mildy soapy water with a tiny drop of ammonia and use a soft brush. Rinse well and dry with a soft jewellery cloth. Any cleaning preparation recommended for pearls is suitable for larimar. 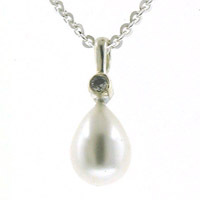 Moonstone gemstones are stored in oil before use in jewellery. This prevents the stone drying out and cracking and an occasional oiling with unperfumed oil is a good idea from time to time. Moonstone and labradorite are iridescent gemstones with a magical glow of colour. 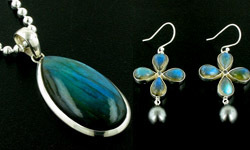 Take a look at our rainbow moonstone jewellery and labradorite jewellery. Always store carefully in a separate jewellery compartment to avoid scratching and chipping. Clean in mildy soapy water with a soft brush. See our chalcedony jewellery and onyx jewellery. Always store carefully in a separate jewellery compartment as despite its Mohs' rating, rose quartz can chip and scratch easily. Clean in mildy soapy water with a soft brush. Rinse well. Our rose quartz jewellery collection is comprehensive. A durable gemstone unlikely to scratch or chip easily. However, always store in a separate jewellery compartment as it may scratch a softer gemstone or precious metal. Avoid harsh chemicals and exposure to heat. See our blue topaz collection of wonderful jewellery. Avoid harsh chemicals and long exposure to heat. Should survive an ultrasonic cleaning. Browse our amethyst, citrine and smokey quartz jewellery collections. Always store carefully in a separate jewellery compartment as garnet is brittle and despite its Mohs' rating, can chip and scratch easily. All garnets except andradite (demantoid) should survive an ultrasonic cleaning. Garnets make fabulous regal jewellery - browse our garnet jewellery. Avoid rapid changes in temperature and exposure to heat. Peridots add freshness to any day - see our large peridot jewellery collection.